By a 54% to 34% margin, more Americans say the priority for addressing the nation’s energy supply should be developing alternative energy sources, such as wind, solar and hydrogen, over increased production of oil, coal and natural gas. 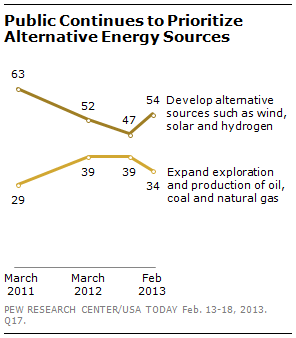 Since 2011, the public has prioritized alternative sources over expanding production. Last October, the gap had narrowed: 47% said the priority should be developing alternative sources while 39% said the focus should be on expanding oil, coal and natural gas. Still, while support for energy alternatives rebounded since then, it is below the 63% who favored that approach in 2011. Democrats and Republicans are divided over these energy policy priorities. About two-thirds (64%) of Democrats put the emphasis on developing alternative forms of energy compared to 33% of Republicans. Conversely, 54% of Republicans favor expanding exploration and production of oil, coal and natural gas compared to 28% of Democrats. But beyond partisan differences, there are stark age differences over energy policy priorities. Fully 71% of those younger than 30 give greater priority to developing alternative sources, while just 24% prioritize increased production of oil, coal and gas.